The technical research performed by Shawn Harrington, BSESM, Director of Accident Reconstruction at ARCCA, along with Gabriel Lebak, Research Assistant, on the topic “The Placement of Digitized Objects in a Point Cloud as a Photogrammetric Technique” has now been published in SAE International’s Journal of Transportation Safety. In their research, the proposed photogrammetric technique of visually placing objects within three-dimensional laser scans was evaluated. When an accident investigator is asked to reconstruct an incident, there may be limited data available to perform the analysis. The limited available evidence, specifically the positions of the subject objects relative to permanent, fixed points, can make it challenging to accurately reconstruct the incident. Thus, the physical evidence that has been documented becomes more valuable and, therefore, more scrutinized. In certain situations, an investigator may be limited to only post-incident photographs taken after a vehicle or other object has already been moved from its post-incident position. Other times, video of the subject incident is available. In these cases, photogrammetric methods are useful and valid approaches for determining the relative locations of moving or stationary objects to permanent, fixed points within the photographs or video. 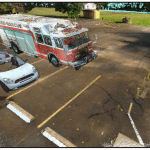 Utilizing this workflow, once the objects have been digitized using a 3D laser scanner, they are then placed into the three-dimensional environment that was created from scans of the incident site. In the 3D environment, the investigator is then able to observe the physical evidence and environment from any perspective, including viewing and measuring what cannot be seen in the video. As a result of their research, Messrs. Harrington and Lebak have developed an expedient, less time-intensive photogrammetric technique for the placement of three-dimensionally scanned objects and environments. This technique can take less than half of the time of a conventional photogrammetric solution. To learn more about Shawn or to contact him, click here. SHAWN HARRINGTON, BSESM, ACTAR, is Director of Accident Reconstruction and a Forensic Scientist at ARCCA. He specializes in the investigation of all types of motor and commercial collisions, i.e., commercial vehicle accident reconstruction, pedestrian impact trajectory analysis, imaging of event data recorders in commercial and passenger vehicles, data retrieval from vehicle infotainment and telematics systems, automotive fraud, and determination of liability.